Allison Avery-Wollenhaupt has been a teacher with The Art Garage for the past three years, and before that was an art teacher in Ohio for six years. 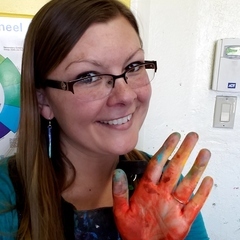 She enjoys helping students access their creativity through the use of art media and techniques, and feels lucky to have such amazing students here at The Art Garage! Allison has her MA and BA in Art Education, and attended Kent State University in Ohio for both degrees.